Our Designer Dies are created exclusively for Wplus9 Design Studio and made to coordinate perfectly with many of your favorite stamps. Made of 100% American steel AND manufactured in the U.S. Able to cut through many materials including felt, paper, corkboard, thin metal, vellum, and transparency. 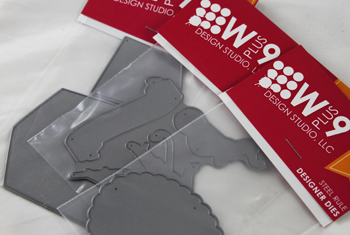 Once you've die cut your shape, removing it will be a breeze thanks to the small pin holes laser cut into each die. Please refer to each machines individual manufacuturer's directions for proper sandwich construction. Some intricate dies or impression plates may require a shim. However remember, you want your sandwich to be snug, but never force it through your machine. Watch the video below for information on which dies can be separated and how to do it.